Feral pigs are the descendants of domestic pigs (Sus scrofa), which were first brought to Australia by early European colonists. 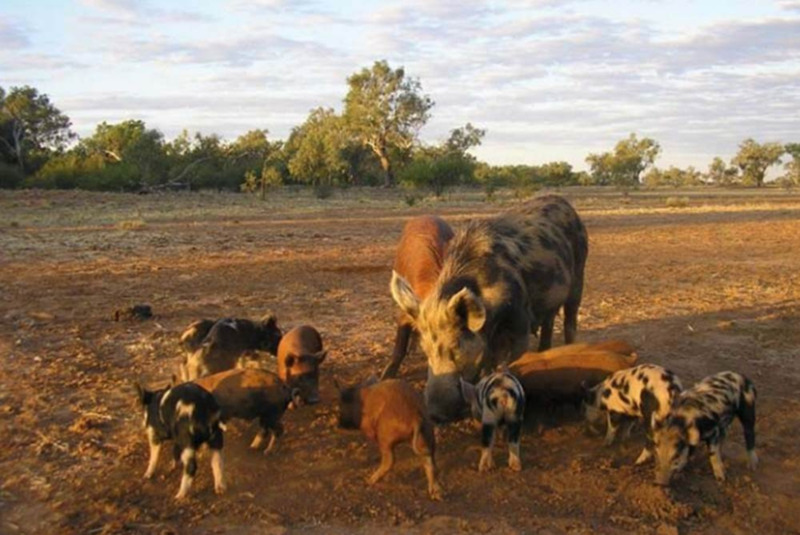 Feral pigs cause a range of agricultural and environmental damage in Western Australia so control measures are important. Pigs are not native to Australia. Domestic pigs were often allowed to range freely to forage for food in the bush and some inevitably became feral, living and breeding in the wild. Accidental or deliberate introductions of domestic pigs into the wild continue even today. Feral pigs vary considerably in size, colour and body shape. Pigs of recent domestic origin tend to be large and heavy and are often white or piebald rather than black. Feral pigs from long-established populations tend to be small, having longer snouts, heavier forequarters and shorter backs than do domestic breeds. Adult feral boars develop a heavy keratinous plaque (shield) under the skin of the shoulders which also occurs in true wild boars. Feral pigs tend to be black in colour. The predominance of black colouration suggests some selective advantage and may be an indicator of a long established population. The 'agouti' pigs found in parts of northern and eastern Australia show colouration typical of the Eurasian wild boar, with dark brindled adults and striped piglets. In the south-west of Western Australia (WA) the proportion of white feral pigs in the population increases towards the south. White and piebald individuals are also quite common in agricultural areas north of Geraldton. Feral pigs are now established in a very wide range of habitats in most medium to high rainfall areas of Australia. They prefer thick cover and need access to water, especially in hot conditions. In WA they occur in large areas of the jarrah forest and adjacent farming areas of the south-west. They are also found in the coastal agricultural areas north of Perth and on the larger Kimberley river systems. Most feral pigs live in groups, which typically consist of one or more adult sows and their litters. In WA groups of more than a dozen pigs are rare, though much larger groups occur in eastern Australia where numbers are high. Male pigs become increasingly solitary with age, and adult boars usually live alone. Individuals or groups may forage over an area of several square kilometres, which always includes a water supply. Home ranges of different groups often overlap, so that many pigs may use the same area. Feral sows can breed during their first year, provided they are in good condition and have reached a body weight of at least 20-25kg. Five or six young are usually born. One litter per year is normal, but with the gestation period of 114 days a second litter is possible if enough food is available for the sow. In WA litters are usually born in winter when food supplies are most reliable. Survival of the young pigs is often poor, but in a good year a feral pig population can easily double in numbers. Feral pigs are true omnivores but they generally rely on plant material for the bulk of their diet. Apart from plants, they will eat earthworms, insects and other invertebrates, amphibians and reptiles, birds and eggs, small mammals and carrion. The presence of adequate protein in the diet is essential for successful pregnancy and lactation. Cereals and other crops, livestock and carrion are eaten when available. Higher densities of pigs are usually associated with agricultural areas where food is more plentiful. Feral pigs are large omnivores with a high reproductive potential, capable of surviving in many habitats and adapting to changing conditions. They are likely to have a considerable impact on the environments in which they become established. Feral pigs directly affect agriculture by feeding on crops and livestock, causing damage by rooting and trampling, and by harbouring and spreading diseases and parasites. Damage tends to be local but the overall costs to agricultural production in Australia were conservatively estimated in 1996 at around $100 million per year. Crops damaged by feral pigs include cereals, grain legumes, sugar cane, orchard and forestry plantings, and pasture. Physical damage to fencing and water supplies occurs, as well as increased soil erosion and reduced water quality resulting from rooting and wallowing. In WA direct losses in grain crops are probably the most significant damage and individual losses to lupin crops may reach tens of thousands of dollars. Livestock production can be affected through destruction of pasture by rooting and grazing, and by direct predation, mainly on lambs. Lamb losses in New South Wales may exceed 30%, although damage is local and apparently caused by a small percentage of feral pigs. Direct predation on livestock is very rare in WA. Damage to native ecosystems is hard to quantify but some effects are clear. Rooting of soil causes physical damage, erosion, and affects soil fauna. Rooting reduces the ground cover, sometimes changes the composition of plant communities and can encourage invasion by weeds. Feeding on native plants and animals is directly destructive, and presumably results in competition with native animals dependant on the same food resources. There is circumstantial evidence that pigs spread the fungal pathogen Phytophthora cinnamomi which causes jarrah dieback disease in Western Australia. They are also reported to spread noogoora burr, a serious contaminant of wool. Pigs can also harbour a number of pathogens affecting livestock and man, including tuberculosis, brucellosis, anthrax, leptospirosis, and tapeworm parasites. Feral pigs would also be susceptible to several important exotic diseases of livestock not yet present in Australia. These include foot and mouth disease, African swine fever, rinderpest and rabies. Should any of these diseases be introduced into Australia and become established in feral pig populations, eradication of the disease would be extremely difficult and costly. The presence of such diseases would have dramatic adverse effects on Australian livestock industries, with immediate losses of export markets worth billions of dollars until eradication of the disease could be proved. It is for these reasons that release or relocation of feral pigs by hunters is irresponsible. Feral pig rooting is conspicuous and characteristic; large areas may be turned over to a depth of 20cm, or small patches or trails dug up. Pigs may root along furrows of a freshly planted or germinating crop. Muddy wallows may be found in wet areas and around dams, tanks and watercourses. Tracks of feral pigs can be confused with those of sheep, goats or cattle in the same size range; in soft soil pig tracks can be distinguished by the presence of dew claws. Pig predation on lambs may not be obvious as the carcass is often consumed completely; however, several features are reported to be characteristic. The lamb is caught after a short chase, and killed by a bite to the thorax. The lamb is then held down by the pig's forefeet, and feeding begins with the intestines and viscera. The flesh and bones of the spine, ribcage and upper parts are then eaten, with the skin of the legs turned inside out to the stifle (knee) joint. The head is then eaten, and finally all or part of the skin and remains of the legs are consumed. On a partly eaten carcass the pattern of feeding and the lack of bite marks and canine punctures, should distinguish the kill from that made by a fox or a dog. It is important to control feral pigs to prevent the build-up of large numbers. Trapping, shooting and poisoning are effective control measures. The Western Australian Organism List (WAOL) contains information on the area(s) in which this pest is declared and the control and keeping categories to which it has been assigned in Western Australia (WA). Use the links on this page to reach feral pigs in WAOL. For advice on pig control contact the Pest and Disease Information Service.